Brain Awareness Volunteers (Left to Right): Casey Steward, Krista Gonzalez, Micheal Langhardt, Monica Bolton, Krystal Belmonte, Kirsten Calvin. Brain Awareness Week with 4th graders from Wallin Elementary and our Brain Awareness Volunteers. Las Vegas Brain Bee 2014, the first Brain Bee in Nevada, was a success! Students from numerous high schools across the valley competed in a neuroscience-themed trivia bowl. We will be sending the first-place winner, Valentina, to compete in the National Brain Bee held in Baltimore, Maryland. The winner of the National Brain Bee will receive an all-expense trip to Washington DC to compete in the International Brain Bee. Las Vegas Brain Bee 2014 Winners & Judges (from left to right): Dr. Merrill Landers, Jacob, Valentina, Aliya, Dr. Jefferson Kinney, Dr. Laurel Pritchard. 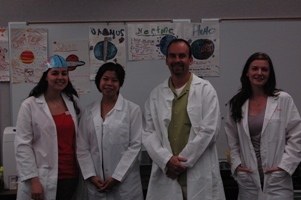 Las Vegas Brain Bee 2014 Judges (from left to right): Dr. Jefferson Kinney, Dr. Laurel Prtichard, Dr. Merril Landers. New Publication — Alzheimer's Disease Biomarkers: Correspondence Between Human Studies and Animal Models. Jon Sabbagh Receives His Doctorate! Thank you to all our UNLV volunteers and to all of the elementary schools that welcomed us! Are you interested in having us visit your school for Brain Awareness Week? If so, contact us at kinneylab@gmail.com! Cashman Middle School Volunteers (Left to Right): Michael Langhardt, Krystal Belmonte, Chris Kaplon, Erin Ramage, Monica Bolton, Caleb Picker, Meghan Pierce. Not pictured: Tory Toles. Wallin Elementary School Volunteers: Christina Vanden Bosch der Nederlanden, Emily Hensleigh, Meghan Pierce, Caleb Picker, Stephanie Nagl, Nathan Rudig. Not pictured: Monica Bolton. Congratulations Monica Bolton for publishing her first manuscript as first author — and also the first research article from the Kinney Lab! This publications details the effects of disrupting glutamate signaling in a Pavlovian conditioning task and alterations to GABA-related proteins. The article, entitled "Deficits in emotional learning and memory in an animal model of schizophrenia", is published in Behavioral Brain Research and can be viewed here. Brain Awareness Week is a world-wide campaign to promote public awareness about the brain and current brain research. We brought the first ever Brain Awareness Week to Las Vegas by visiting Wallin Elementary to teach the 4th graders all about the brain! Following an interactive lesson, students participated in various hands-on activities, including things like building a neuron and matching various animal brains (based on weight) with the proper animal. Thank you Wallin Elementary for allowing us to come and share our passion about the brain with you! Jon Sabbagh published his first manuscript, as first author, detailing data obtained from the work performed for his master's thesis project. This experiment was aimed at addressing whether donepezil, a commonly used drug to treat Alzheimer's disease. could offset learning and memory deficits tied to galanin-induced deficits in rodents. New Publication — Are Working Memory Deficits in Bipolar Disorder Markers for Psychosis? Society for Neuroscience 2009 — Chicago, IL. Society for Neuroscience 2009 was a first for many things: Jon Sabbagh's first poster presentation at a professional conference and Dr. Kinney's first SfN as a Principle Investigator. Dr. Kinney smiles in front of his first SfN poster as Principle Investigator.